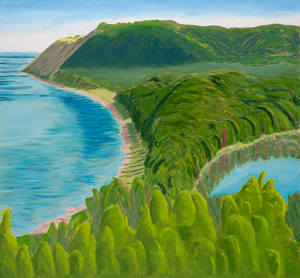 Empire bluff (2010): How to depict the intricate foreground on top of the Empire bluff at Lake Michigan with its multitude of greenery – wildflowers, grasses, grape leaves – still in the early morning shadow? Looking at Cézanne’s early morning shadowed foregrounds inspired me to abstract the complexity of the foliage covering the sandy dune. 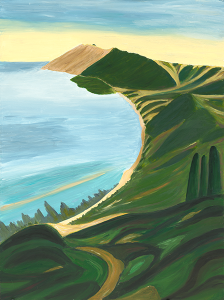 Divide( 2018): An Empire bluff view from below the top. The distant Lake Michigan and South Bar Lake, divided by the Empire village beach, are viewed across a foreground of trees illuminated by the early morning sun. Again, at first I failed attempting to paint the complexity in the foreground, the sun-lit leaves. This time, I found inspiration in the paintings of Emily Carr, the great Canadian painter of the first half of the 20th century. 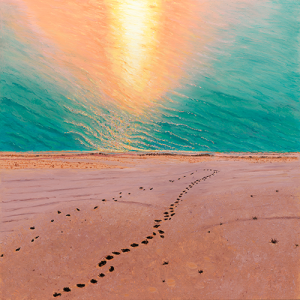 Footsteps in the Sand(2018): This painting was done rapidly within one month after arriving in Michigan from New York City because of the early June deadline of the Grand Rapids artprize.com. No time to spare asking for advice from the living or the dead. I soldiered on by myself to paint ‘Footsteps in the Sand’ and it was fun! Why was painting the foreground of the ‘Footsteps’ easier for me? Maybe it has to do with my childhood visual experience. Nearly every day, I left the gray concrete of my apartment building to walk my dog on a dyke that protects my German hometown Wilhelmshaven (below sea level at high tide) from the North Sea. One could walk on a gravel path on top of the dyke or below its grassy slope on a brick path framed by granite boulders descending to the ocean water. The low tide exposed the mudflat ranging from Denmark to the Netherlands. While in the granite boulders in the foreground were visually stimulating, most of my viewing extended into the distance, across a large bay of the North Sea, the Jadebusen. Thus, I grew up viewing vast distances rather than lovely flowers in front of me. What comes to my mind is a decade-old experiment with kittens that, raised in an environment of vertical bars, were oblivious to a horizontal bar and ran up against it rather leaping across it. In contrast, walking my dog at the North Sea attuned me to horizontal rather than vertical lines present in mountains and city-scapes. The sparse, sandy foreground of ‘Footsteps in the Sand’ was well within my visual comprehension.